Donna Walker-Kuhne is acknowledged by the Arts & Business Council of America as the nation's leader in Audience Development. Donna Walker-Kuhne's new book, Invitation to the Party is a best seller in the North American arts industry. Donna Walker-Kuhne inspires and challenges with arguments proving that marketing the arts to culturally diverse audiences and youth is a commercial imperative - not welfare. Donna Walker-Kuhne served as the Director of Marketing and Audience Development for Joseph Papp - Public Theatre in New York, from 1993 - 2003. At the Public Theatre she originated strategies that drew thousands of intergeneration audiences from diverse communities to the New York Shakespeare Festival. Shakespeare was moved to the East River reaching Puerto Ricans, Italians, African-Americans, Chinese, Jews and new immigrants. Donna Walker-Kuhne began as a dancer with the Najwa Dance Corps and received her Juris Doctor from Howard University School of Law, Washington D.C. and Bachelor's Degree from Loyola University, Chicago. Theatre Magazine named her one of The Top 50 Faces Who'll Be Forces in the Theatre's Future. 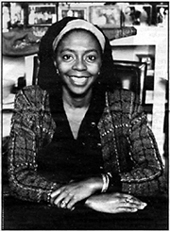 She was awarded as one of the 2002 Dynamic Women Awards by Councilman N. Perry in Brooklyn, New York. Donna's tour of Bring in 'da noise, Bring in 'da Funk, increased audiences across America by more than twenty per cent, by increasing the show's staff with African-American members a more committed effort was put forth by the company. Donna Walker-Kuhne works with numerous museums, galleries and arts councils throughout the US. She is a Professor in arts marketing at Columbia University, Brooklyn College and New York University. She has been nominated for the Ford Foundation's Leadership for a Changing World Fellowship. To date Donna Walker-Kuhne has generated over $12 million in income for various organisations and institutions by promoting the arts to culturally diverse audiences. Donna Walker-Kuhne's tour is managed by Kape Communications for the Multicultural Arts Marketing Ambassadors Strategy WA and the Multicultural Arts Professional Development programs. The national tour has been funded by the Australia Council for the Arts, with the support of the Department of State United States of America, Department of Culture and the Arts, Office of Multicultural Interests - Government of Western Australia, Arts Victoria, the Victorian Multicultural Commission Government of Victoria, Arts Queensland and the Queensland University of Technology, Arts SA the Government of South Australia. This program has been supported by the Australian Multicultural Foundation, ICE NSW, Casula Power House Arts Centre NSW, Riverside Theatres Parramatta, Enmore Theatre, Nexus Multicultural Arts Centre and Multicultural Arts Victoria.